WANT TO KNOW THE HISTORY OF THE FAMOUS PHILLY CHEESESTEAK? We’ll fill you in. Well, at least about Geno’s but that’s all you really need to know. Geno’s was founded by one of Philly’s own, Joey Vento in 1966. The man had two boxes of steaks, a few hot dogs, and $6 in his pocket when he turned on the grills at 9th and Passyunk. Neighboring joints predicted he’d last six months, tops. Joey didn’t listen. He stuck to what he knew and what he knew was steaks. Joey learned the ropes working in his old man’s steak shop in the 40’s. It was in that kitchen that Joey mastered cooking a steak to mouth-watering perfection and grilling an onion so it had just enough bite. Little by little the shop at 9th and Passyunk drew more attention. Before long, people were saying they were the best steaks they’ve ever had. Joey kept at it. Business was booming in 1971 when Joey and his wife Eileen had a baby boy. Always one to do things his own way, Joey decided to name his son (yep, you guessed it) Geno. As soon as he was old enough, Geno was right there beside his dad, learning about the family business. From 17 on, you could find him at the shop, making the famous Philly cheesesteak, taking orders, and meeting with customers – learning every aspect of the business Joey built. Joey Vento passed away in 2011. 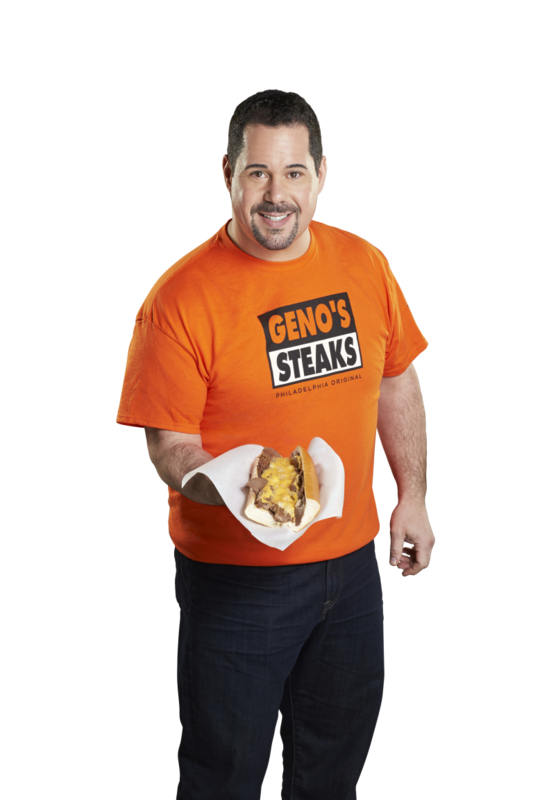 Geno has since taken over the shop and is carrying on Joey’s legacy by serving up the famous Philly cheesesteak. We’ll fill you in (then we’ll fill you up). We use only the best, thinly sliced rib-eye steak so it grills up nice and juicy (never greasy). Our onions are always fresh, our bread always comes straight from the oven, and our cheese…well it’s cheese. You can never really go wrong with cheese. Most people think our sandwiches are perfect just the way they are but if you want to add ketchup, mustard, or relish, we’ve got all three ready and waiting.